Length Overall: 93.5 cm. Blade: 79.5 cm. The blade of this excavated sword is straight and double edged, entirely typical for this period, with relatively little taper (17 %) until the somewhat spatulate point. The central area of each face shows traces of pattern-welding which occupy just about half of the 4.5 cm. maximum blade width. A very slight fuller or shallowing, presently only 0.02 cm. in depth, coincides with the pattern-welded areas of the forte of the blade; distally, the zones of pattern-welding forming the faces of the blade appear to be flat. Three bands of pattern-welding may be discerned, which alternate in unison between a straight pattern (between the green arrows in the illustration below) and twisted pattern (a rosette may be discerned just below the orange arrow). The remaining hilt elements are of iron and show less corrosive damage than the blade. The tang passes through the pommel and the tip of the tang has been peened to affix the pommel. Seen in profile, the pommel appears vaguely lobulated and is decorated with three sets of three lines each running parallel to the blade. Both pommel faces are decorated in the same manner. One set of lines is along the centerline while the other two sets may be seen to begin where two thinner lobes each extend outward from a thicker core in the plane of the blade (viewed from above as B in the illustration below). The ends of these two lobes are each further set off by a diagonal groove. No evidence of attachment points for further hilt elements are seen upon this pommel or upon the plain and flat iron oval crossguard. This sword is difficult to classify. The shape of the blade and the presence of relatively complex pattern-welding combined with a very shallow and broad fuller are all most consistent with a late Migration Period to early Viking Age date. Small lobulated pommels such as this had evolved during the course of the Migration Period from tang buttons and were usually still employed in conjunction with an upper guard, which, like the lower guards of the period, were often composites of metal and organics sandwiched together. If traces of an upper guard were found with this sword they are now lost. The possibility that the plain iron crossguard is a modern replacement cannot be ignored, though the appearance of the patination is most convincing in suggesting that the guard is original. 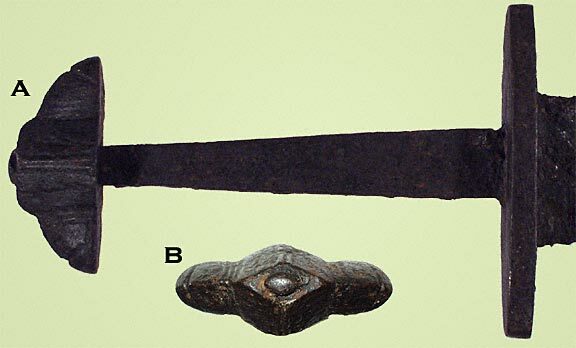 The size and shape of the pommel are most consistent with Behmer's type VIII, however, the simple iron crossguard, without evidence of attachment of other layers, is more suggestive of his type IX; both of these types comprise Behmer's Group C and represent the stylistic transition into the Viking Age.